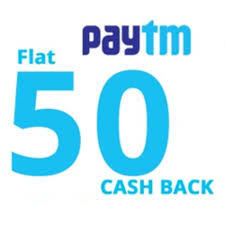 Paytm – Get Rs 50 Cashback on Rs 50 Recharge (New users, New Number). Paytm is back again with awesome deal for those who haven’t recharge their Number with Paytm Yet nor Signup on Paytm. Paytm is giving Flat Rs 50 Cashback on Rs 50 Recharge. So Hurry up and avail this Offer Now !! 3) Initiate a Mobile recharge or bill payment. (Make Sure Your Number has not been Recharged on Paytm before). 7) You will get the Rs 50 Cashback instantly. 1) Use Promocode FIRST/CDFIRST to be eligible for this offer. 2) Minimum transaction amount must be greater than or equal to Rs 50. 4) Click “Proceed to Pay/Recharge” and enter FIRST/CDFIRST in “Have a Promocode?” section. 6) Promocode is valid only on new numbers that have never been recharged/bill paid before on Paytm. 8) Valid only on first Recharge or Bill Payment only. 9) Applicable for First time users only.